The Axanar infringement lawsuit has had so many blog postings that they are now all being collected in one place. 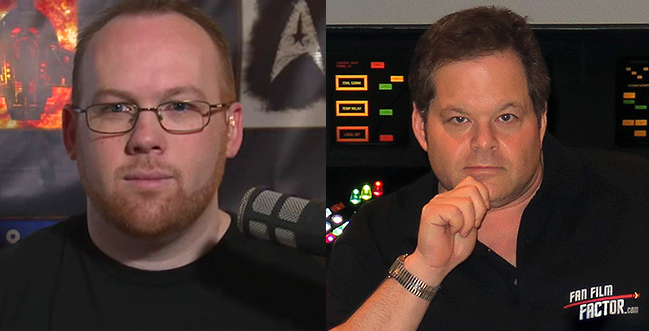 Last Wednesday, we debuted Part 1 of a three-hour discussion and debate about all things AXANAR between myself and Australia-based Star Trek blogger MATTHEW MILLER. We both have very strong feelings about the Axanar project and its show-runner ALEC PETERS, and we’ve never been particularly shy about sharing those feelings and opinions in various public forums. But now we’re doing in it the same forum at the same time, voicing our disagreements directly to each other to see if there’s any common ground…or if the two sides of this controversy are destined to simply never come together. Last time, we primarily discussed the building of Ares Studio, followed by some brief commentary about the fan film guidelines. And just before ending Part 1, we left off having just scratched the surface of our next (BIG!) topic: the copyright infringement lawsuit. Should Alec have fought the lawsuit as intensely as he did, or should he have just settled and moved on? Did CBS and Paramount offer a settlement when the lawsuit was first filed? If not, when did they first make a settlement offer…and what were their terms? Why did Alec and CBS/Paramount finally decide to settle the lawsuit two weeks before trial? Were the final settlement terms more favorable to Alec, to CBS/Paramount, or pretty much even? What would have happened if Renegades, New Voyages, or Star Trek Continues had been sued instead of Axanar? Why have things escalated so much over the years? Are Carlos’ blogs telling only half the story and thereby reinforcing pre-existing detractor biases? Does Carlos rush to publish negative blogs and purposefully avoid reporting positive Axanar news like Axacon (which still hasn’t been covered on Axamonitor after six weeks)? And what about Fan Film Factor? Am I telling only half the story, too? And check back Wednesday at 2:00pm Pacific Time for Part 3! Okay, folks, it’s the moment you’ve all been waiting for! (Well, maybe not ALL of you…but at least a few hundred, I’m sure.) Earlier this week, I revealed the “origin story” of this two-way interview where blogger MATTHEW MILLER from Trekzone.org and I discuss and debate all things AXANAR. Now it’s time to put our money where our mouths are (Australia and Los Angeles, respectively). Did “most” of the principal cast and crew abandon the project after ALEC PETERS decided to use crowd-funded money to build a “for profit” studio? Or is that just a rumor-turned-urban-myth? What exactly is a “for profit” studio anyway? Is someone gonna go out and buy a 60-foot yacht with all the cash that comes in? Was the decision to try to turn a Valencia warehouse into a soundstage a mistake in the first place? Did CBS ever tell Alec (before the lawsuit) not to create a studio or not to make more Axanar? 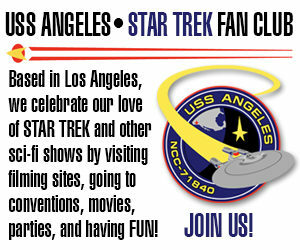 Did the Axanar donors know (back in 2014) that they were donating to build a soundstage, or were they misled to believe they were donating only to produce a fan film? Were there “unpublished” guidelines for fan films before June of 2016? Were the guidelines, once they were announced, intended to stop Axanar…or were they targeted on Renegades and the other “arms race” fan productions? Come back for Part 2 on Monday and Part 3 next Wednesday. Coming in 3 days: the BLOGGER-BATTLE OF AXANAR! These days, I don’t typically engage directly with the AXANAR detractors. There’s no point. I’m not gonna change their minds, and they’re certainly not gonna change mine. Any “discussion” we get into quickly breaks down into all the old beating-dead-horse accusations and rumors and criticisms—often with a generous helping of vitriol and vulgarity—and frankly, it’s just a waste of my time. When we set out to have our across-the-globe (Matt’s in Australia) audio “smackdown,” we had no idea how long the discussion would last or how heated it would get. There were no rules and only a loose outline of topics/questions to guide us. Our intention was to keep things civil, and for the most part, we did…although not completely. When all was said and done, we’d managed to go at it for nearly three hours over the course of two days of Skype calls! On the second day, I’d caught my son’s cold, and if you listen carefully, you’ll probably hear from my voice the exact point when the day one conversation ended and day two began. What makes this interaction between me and Matthew so interesting and enlightening (and dare I say “fun”?) is that we actually interview EACH OTHER. Matt’s done scores of interviews with notable Trek people, as have I. So rather than simply having one of us interview the other, we ask questions back and forth…and tough questions at that! And best of all, unlike the recent pay-per-view Michael Hinman/Carlos Pedraza podcast on Alpha Waves Radio, this one is not only presenting BOTH sides of the controversial topic (rather than a simple echo-chamber), but it’s also absolutely FREE to listen to! So how did this whole “Blogger Battle of Axanar” come to be? Author Jonathan LanePosted on December 9, 2018 December 10, 2018 Categories Axanar Lawsuit, Editorials, NewsTags Alec Peters, Axanar Productions, Jonathan Lane, Matthew Miller, Trekzone20 Comments on Coming in 3 days: the BLOGGER-BATTLE OF AXANAR! Here’s a summary of Day One, and here’s a summary of Day Two. My head hit the pillow on Saturday night, I blinked, and it was suddenly 7 hours later (thank you, daylight savings! )—I was that exhausted after two days of Axacon. But now I was recharged with only one day to go…and this day was much less hectic. I was only scheduled to lead two panels, and nearly everyone I could think of had already been interviewed in the director’s chairs alcove. I heard the shower running in the bathroom that I shared with STEVEN “Admiral Slater” JEPSON (we each had our own bedrooms in Alec’s house), so I started packing up my stuff. I’d be leaving the con and taking the hotel shuttle directly to the airport a little after 4:00pm. When Steven was done, I hopped into the shower and got myself dressed. Steve was already downstairs, and for a little while, it was just the two of us waiting for the others. Over the weekend, Steve quickly became one of my favorite people in the entire Axanar brother-and-sisterhood. A music and vocal teacher at the University of Missouri School of Music, Steve is also a singer and performer, and a really smart, well-spoken guy. And like me, he’s incredibly funny (see what I did there?). 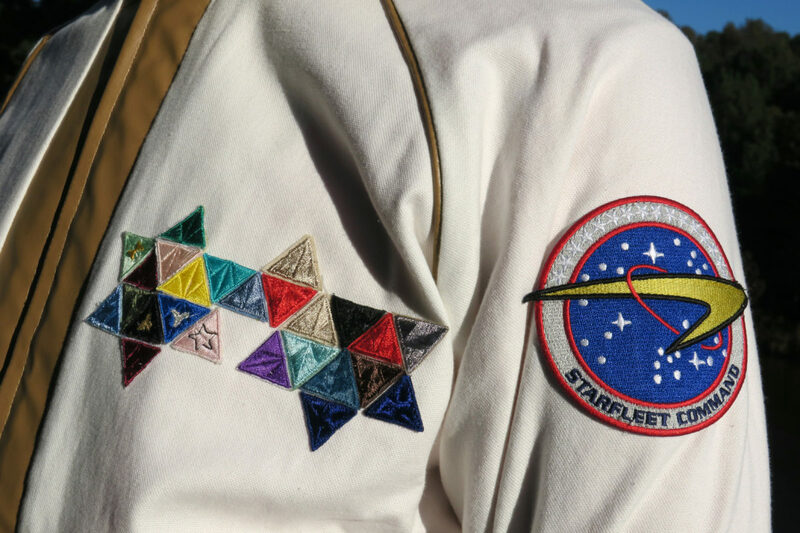 As we waited for the rest of the posse to get ready, Steve and I admired the new Starfleet admiral’s uniform, had-sewn for Steve by Axanar costumers CLAUDE FRANCIS DOZIÈRE and ANGELA AVINO from Italy. Steve’s original Admiral Slater uniform was the same one worn by actor TONY “Admiral Ramirez” TODD…who is a BIG guy! When Steven tried the uniform on for his photo, it was like wearing a parka. So it literally needed to be clipped (with binder clips) all along the back in order for Admiral Slater not to look like a toddler wearing his daddy’s Starfleet uniform. Click here for a summary of Day One of Axacon. It began with breakfast at ALEC PETERS’ house. After Friday’s multiple skipped meals, I wasn’t gonna make the same mistake again…not with everything I was expected to do on Saturday! And anyway, Alec provided quiche! After fueling up our bodies, the five residents of Casa de Peters piled into three cars to drive the 45 minutes to the Crowne Plaza Atlanta-Airport hotel. Arriving about 45 minutes before Axacon and its host convention SphinxCon kicked off, we each carried boxes and posters and Garth’s original costume and loads of other stuff in from Alec’s trunk. 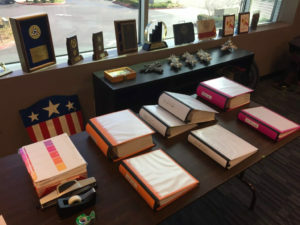 I found myself immediately impressed by how organized everything seemed to be. Those Honor Harrington fan volunteers from the Royal Manticoran Navy certainly had their their act together (and looked really spiffy in those black military-style uniforms!) with folks assigned to security, check-in, set-up, etc. The fellow handling the A/V system carried along about 15 different cables and adapters to make sure anyone could get video and sound from their laptop to the large monitors in the panel rooms. I love a small, intimate convention…especially one with guest celebrities. While the huge Creation Cons and Dragon*Cons and San Diego ComiCons can be mind-blowing, the quiet, intimate setting of a small convention is a unique and treasured experience for me. In my youth, it was at small cons where I once had breakfast with James Doohan, went jogging with George Takei (okay, I rode my bike alongside him…and could still barely keep up! ), and helped a falling-down drunk Colm Meaney find his hotel room in the Marriott Hunt’s Valley Inn (“This place is a fookin’ maze…!”). Good times. I hadn’t been to a small con in many, many years. And I didn’t realize how much I miss them…until this past weekend when I went to Axacon in Atlanta, GA. Axacon was never meant to have tons of attendees. The 30-40 people who showed up over the three days was about what ALEC PETERS had expected. In fact, there were only about three dozen chairs in the Axacon panel room…a larger turnout wouldn’t have had a place to sit down! This time, though, I wasn’t just an attendee; I was a guest. And Alec made sure to put me to work earning my free room and board. I stayed over at his home and even had my own bedroom, as did fellow house guests STEVEN JEPSON (Admiral Slater) and LEE QUESSENBERRY (Axanar art director and webmaster). Both of these men are now two of my favorite people. In fact, the whole convention was filled with folks who are now my favorite people! That’s just the kind of weekend it was. There was love here, friendship, camaraderie, and a feeling of shared teamwork and dedication to bringing a dream to life. I’m sure that Alanis Morissette would appreciate the irony. After years of accusing ALEC PETERS of lying (and a host of other evil deeds), one prominent detractor actually lied about flying to Georgia and attending Axacon this past weekend. SHAWN P. O’HALLORAN is one of the three admins for the Axamonitor Facebook group, one of the main hang-outs for Axanar detracting. If you’re not familiar with just how negative they can go, while I’m loathe to send anyone there, take a look at how they reacted to photos of the bridge that they all said would never be completed. Sour grapes have seldom been so sour. 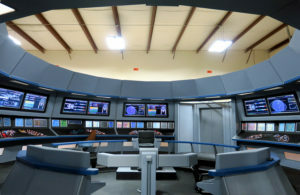 Photos of the AXANAR bridge set! Hey, guys. Not a lot of time to blog. I flew out on a red-eye from Los Angeles with minimal sleep last night, arrived in Atlanta at 6:30 am, and got to ALEC PETERS’ house about 8am. Thank goodness he didn’t ignore the doorbell (he’d been pulling consecutive all-nighters with the team to get the USS Ares bridge completed). After taking a 3-hour nap in one of Alec’s guest bedrooms, I got ready for my first-ever trip to OWC studios. Alec put me to work almost immediately, tasking me and my co-host KEITH M. SEDOR with conducting a number of video interviews with various guests. I spoke with ALBERT MARTINEZ (the creator of Chasing the Infinite Sky), DON GAFFNEY (Star Trek prop-maker and Klingon expert), DANA WAGNER (who is supervising the completion of the bridge set), and his wife ALLISON (who works with the local school district getting high schoolers access to the the set at the studio for ultra-cool student projects). Keith got to interview GARY GRAHAM (Soval) and J.G. HERTZLER (Sam Travis/Martok). I’ve interviewed J.G. before, so Keith got the big celebrities. Unfortunately, all that work prepping, doing pre-interviews, and conducting the interviews themselves didn’t give me as much time for photos and videos as I wanted, but Alec hired a 4-person professional film crew to record the entire event. 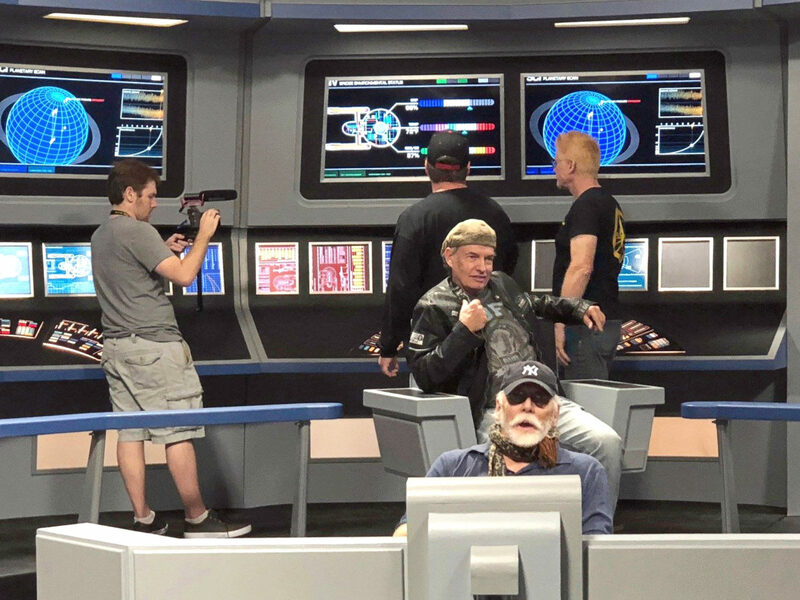 This included about 40 people wandering through the bridge and, at one point, being treated to a live read-through of two scenes from the full 90-minute Axanar script (which will, eventually, be released in both written and audio format). The readers included Gary, J.G., Alec, and STEVEN JEPSON (Admiral Slater himself). It was really awesome hearing Gary and J.G. doing a dramatic script reading—they’re both incredibly gifted actors. There were even special Axanar cookies brought in by one of the attendees! It was a super-fun day for everyone who made the, er, trek to Lawrenceville…and there’s even more on tap for Saturday and Sunday (including a panel of upcoming fan films with some footage debuting exclusively at Axacon!). 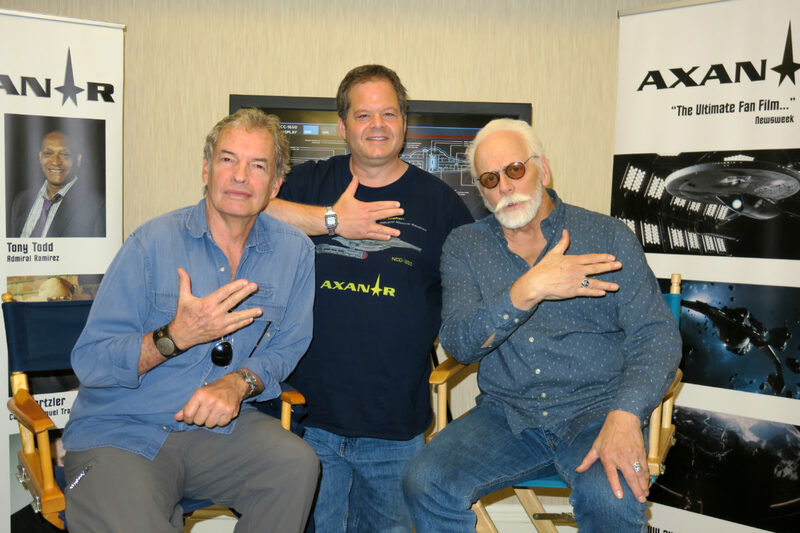 Author Jonathan LanePosted on November 2, 2018 Categories Axanar Lawsuit, Fan Film Features, NewsTags Alec Peters, AxaCon, Axanar, Gary Graham, J.G. Hertzler66 Comments on Photos of the AXANAR bridge set! I seriously considered telling Carlos to come to Atlanta and sit down and go through the detailed finances with me. I would even pay for my accountant from highly respected accounting firm Frazier and Deter to be there. But you know, it won’t change Carlos’ mind, and he would still twist it to serve his agenda. Facts don’t matter to him. He will lie, manipulate and twist anything as he has done for almost three years. Just about anyone in the Axanar world, especially donors, are more than welcome to Axacon, which is meant to be a celebration of Axanar and our fans. And frankly, I would probably sit down with anyone to review our finances in detail and share everything if I was asked. But not Carlos. He and his minions have made up their minds and only the facts that support their world view will be accepted.